Do you have a water leak? - RJ Kuhn, Inc.
First, find the water meter in your house. Typically found in the basement or mechanical room, it will be on the main water line coming into your home. The numbers in the box represent either gallons or cubic feet of water used in your home. Check your meter when no one is using any water, wait for two hours and check the water meter again. If the meter does not read exactly the same, you probably have a leak. 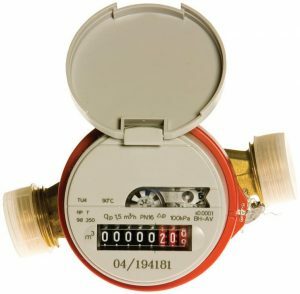 Some water meters are equipped with a leak indicator in the center of the face. Typically a small red triangle. Again, with no water being used, note if this indicator moves at all. If it does, you have a leak. Second, identify the leaking fixture. Toilets: Listen for running water or conduct a food coloring test. Add enough food coloring to tint the water in the toilet tank. If color shows up in the bowl, you have a leak. Also check for water around the base of the toilet. Faucets: Look for drips from the spout or water around the base of the faucet. Showerheads: Shower heads will drip for a short while after use, typically less than a minute. Return to check for drips after the shower hasn’t been in use for a bit. In the tub: A leak in a tub valve can be seen dripping from the spout or they can actually run out the back of the spout at the wall. This can make them a bit tougher to spot. Under the sink: Check for any water around pipes and rust around joints and edges. Faucet: Similar to the lavatory faucet, look for drips from the spout or water around the base of the faucet. Sprayer: A hand sprayer is another valve that’s prone to leaking. Check to make sure water isn’t leaking and running unnoticed into the sink. Under the sink: Check for water around pipes and rust around joints and edges. Appliances: Use a flashlight to check for pooling water underneath dishwashers and refrigerators with ice makers, which could indicate a supply line leak. At the spigot: Be sure the faucet is off after each use. Frost proof faucets will drain out and can drip for several minutes after use. Be sure to check these faucets about 10 minutes later.